Restaurant: There are several restaurants within walking distance of the clubhouse. Showers: Two showers are available inside the SHYC clubhouse. Lockers: None on site. A locked designated area will be set up for storage of competitors’ belongings. Trailer storage: All trailers will be stored in location “C”. Boxing Rock Brewing Company: 78 Ohio Road. Tasting and hospitality room available 7 days a week. Book early! Accommodations fill up quickly. There is a small area designated for RV parking. See location “D”. There are no hookups available. There is a designated dumping station at the Islands Provincial Park, approximately 5 km away from the regatta site. Dumping fees may apply. The Shelburne Guild Hall will be the designated meeting area for pre-racing briefings, and post racing gatherings. Daily prizes, events and entertainment will all occur here, as well as the mid-week barbecue dinner. A bar will be set up in the afternoons serving craft beer from the Boxing Rock Brewing Company. There are two available parking areas. The first is designated location “A” for sailors whose boats are designated to be stored near the Town Wharf and Ramp. Location “B” is the Shelburne Harbour Yacht Club parking lot. 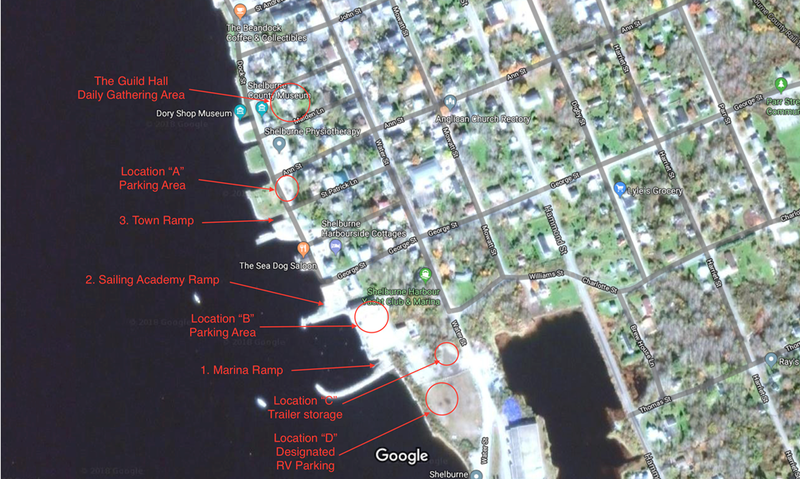 Sailors whose designated boat storage locations are near the Yacht Club building are asked to park their vehicles in this location. Parking is free and we ask that competitors’ vehicles remain parked in their designated parking areas. Please keep vehicles away from launch areas. TheBinnacle.com. Orders may be placed from The Binnacle by telephone. Yachtshop.com. Orders may be placed from YachtShop by telephone. Orders placed before noon will arrive via courier the next morning by 08:30. Shipping fees will apply for all orders. Children under 10 are welcome on the premises if accompanied at all times by an adult. Please remember that you are responsible for all children you bring onto the SHYC site. Lifejackets must be worn while on any dock area. Competitors’ coaches must register with the registration desk in advance. Daily coaching fees and coach boat berthing fees will apply. Amounts TBD. Shelburne Harbour Yacht Club welcomes visiting competitors and their families. Use of the SHYC facilities for two weeks prior to, and during the 2019 International Championship is reciprocal to those who are members of their respective home clubs. Those wishing to join SHYC may do so. Membership fees are $150 per year for individuals, and $300 per year for families. Dogs are permitted on site but must be kept on a leash at all times and any mess must be cleared away immediately. Dogs are not allowed inside the SHYC building (except guide/assistance dogs). Areas around the SHYC clubhouse and launch facilities are public access areas. Please bear this in mind. Onsite overnight security will be provided, but all materials and property stored in public areas are at competitors’ own risk. There are three designated launching areas designated on the site plan. Please use the launch and retrieval area you were designated for the entirety of the event. Wi-Fi is available free of charge. Please inquire at the bar for a WiFi password. Halifax Stanfield International Airport hosts flights from many points worldwide including many US cities, and from Heathrow and Gatwick airports. Daily, weekly and monthly moorings are available on a first-come-first-served basis. Locations are within a 3 minute walk.